Miguel Avila becomes grantee of Rancho San Miguelito – 136 acres of land bordering the bay of San Luis Obispo. In 1867 his son sold parcels of the land and established the town of Avila, which later became Avila Beach. John Harford builds Harford Pier (now Port San Luis Pier) for exporting the County’s products. The first pier is 540 feet long. A narrow gauge railroad to the pier is constructed, which eventually became part of the Pacific Coast Railroad. In the late 1870’s the pier is extended 1400 feet to deeper water and the Ocean Hotel is built for passengers waiting for ships. The Ocean Hotel is purchased by the Marre family and becomes the Hotel Marre. The People’s Wharf is built at Avila Beach (near to where today’s Avila Pier is located) and included a narrow-gauge railroad from the end of the pier to a warehouse in Avila Beach. This pier was destroyed in a major storm in early 1878. During this time period both the People’s Wharf and the Harford Pier were used commercially for shipping goods and passengers to and from San Luis Obispo. Planning and construction begins on the breakwater at Point San Luis on the west end of the bay providing further protection for the Harford Pier. The present-day Avila Pier is constructed by the County of San Luis Obispo. Not as well protected as the Harford Pier, it sustains major storm damage throughout the years and is repaired after each event. In 1908 President Teddy Roosevelt sends the American navy’s "The Great White Fleet" (http://www.history.navy.mil/library/online/gwf_cruise.htm) on a worldwide diplomatic mission of peace. The fleet consisted of four squadrons of warships that were manned by 14,000 sailors. The cruise covered a distance of 43,000 miles, included 20 port calls on six continents, and took 14 months. On April 30, 1908 “The Great White Fleet”, en route from San Diego to San Francisco, anchored offshore at Avila Beach. Two thousand local residents are on hand to view the site. The Pacific Coast Railway offers excursions from nearby communities to the beach. Businesses and schools were closed for the event. Union Oil, along with other companies, lays over 200 miles of pipeline from the San Joaquin Valley oil fields to the tidewater facilities at Avila. 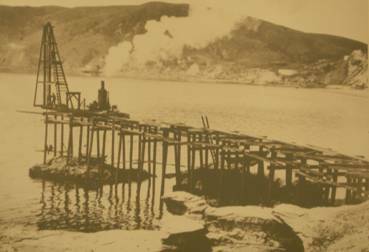 The first pipe was laid on July 29, 1909, and the first oil poured out at Port San Luis in March 1910. Prior to World War I, this was the largest oil pipeline project in the world. Field storage for 27 million barrels of oil was created at a tank farm in San Luis Obispo as well as at Avila Beach. Harford Pier was extended to 1400 feet, into 31 feet of water to accommodate the large oil tankers. Union Oil becomes the sole owners of the pipeline. 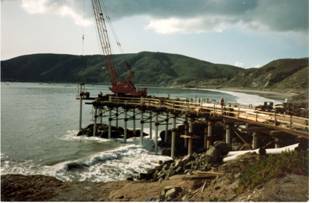 The Pacific Coast Railway Co. constructs a pier at Port San Luis for commercial shipping. The pier is located between the existing Avila and Harford Piers. Union Oil Co. of California (later Unocal) leases this new pier and expands their operations. During this time period oil is shipped from both the Harford Pier and the Pacific Coast Railway Co. Pier and Port San Luis becomes the largest crude oil shipping port in the world. The last oil is shipped off of Harford Pier, and thereafter all oil out of San Luis Bay is shipped off the Pacific Coast Railway Co. Pier. With the arrival of the standard-gauge Southern Pacific Railroad and the Great Depression, use of the Pacific Coast Railroad Company and the piers declined. The oil transportation facility was abandoned and the 1400 ft extension portion of the Harford pier was demolished to aid navigation in the bay. Union Oil buys the Pacific Coast Railway Co. Pier and changes the name to Union Oil Pier. The pier plays an important roll in supplying the U.S. Pacific Naval Fleet with fuel during World War II. Within two weeks of the United States’ declaration of war, the Union tanker Montebello (http://www.cinms.nos.noaa.gov/shipwreck/dbase/montebello_2.html) finishes loading at the pier and heads north toward Vancouver. Two hours later, a Japanese submarine hits the tanker in the port side with a torpedo. Surfacing, the submarine shells ship as the tanker crew takes to lifeboats and row for shore. Not a single crewman is injured. During the war years Avila Beach residents had to black out their windows at night and all pier lights were extinguished. Soldiers were camped nearby and practiced their maneuvers on the beach. 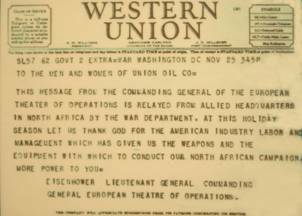 commending the company for its role in the war effort. The Port San Luis Harbor District (http://www.portsanluis.com/) was created in 1954. In 1955 the State Legislature granted the Harbor District the area’s tidelands in trust. The Harbor District eventually acquires the Harford Pier and surrounding land and roadway. In 1984 the State of California and San Luis Obispo County transferred ownership of Avila Beach, including the Avila Pier, to the Harbor District. The Harbor District oversees and manages the shoreline and open waters of San Luis Bay between Point San Luis and the Sunset Palisades area of Pismo Beach. Included in this area is the Harford Pier, the Unocal Pier, and the Avila Pier. published in 1937 this 1955 edition was 25 cents. The California Coastal Commission (http://www.coastal.ca.gov/) is established under Proposition 20 and later was made permanent by the Legislature through adoption of the California Coastal Act of 1976. The Coastal Act requires the Commission to review all development on land or water areas in the coastal zone subject to the public trust. 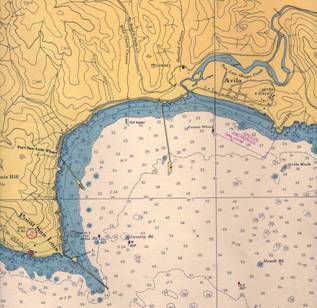 Included within their jurisdiction is the area within the Port San Luis Harbor District as well as the Unocal Pier. The pier remains a major oil shipping point until it is destroyed by a fierce storm in March of 1983. Three company employees (Jack Spaulding, Donald “Dutch” Van Herreveld and Loren Woods) are on the pier assessing damage done by the storm, when a 25 foot wave broke over the section on which they are standing (about ¾ of the way out) and the pier collapsed. The three were able to grab onto a floating section of the pier and about 45 minutes later are safely rescued by Harbor Patrol officers on the boat Sylvester. 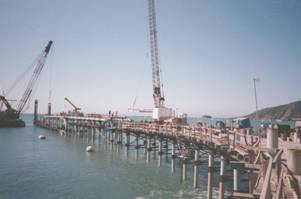 Unocal spends $27 million to replace the destroyed wooden pier with a steel and concrete pier. The pier extends six-tenths of a mile into the bay and is constructed in the same footprint as the original pier. The contract is granted to Santa Fe Braun Co. of Orange, California. Starting on the shore side, holes were drilled in the bedrock. Then “pin piles”, varying in size from 10” to 24” in diameter, were placed in the bored holes. Eighteen inch to thirty-two inch diameter piles were then placed over the pin piles and driven as deep as they would go. Concrete was poured to fill the space between the pin pile and driven pile. Both sets of piling were heavy duty steel, some of which have one-inch walls. The driven pilings were coated with epoxy paint and wrapped. 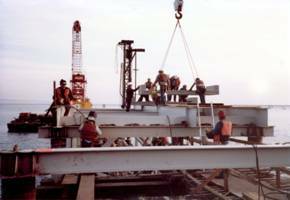 The steel pilings, caps, stringers, bracing and decking were fastened together by electric welding. 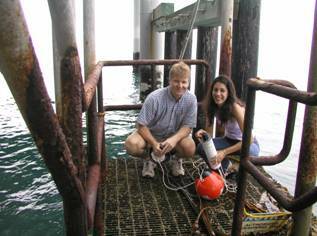 Cathodic protection was used to protect the pilings and hinder depreciation of the pier. The Cathodic protection has a life-span of 40 years and the estimated life time of the pier is at least 100 years. The pier transports an average of 8 to 10 million barrels of crude oil and refined products per year until Unocal concludes its oil operations at the pier. In the early 1990’s the Avila Valley Advisory Council (http://avac-avila.org/) is formed as a private organization. The Council’s purpose is to advise San Luis Obispo County and other public decision making bodies having jurisdiction over any aspect of planning and development in the Avila Valley area. 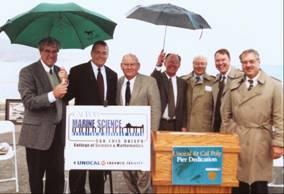 Unocal donates their pier to Cal Poly’s College of Science and Mathematics for the Center for Coastal Marine Sciences. A dedication ceremony celebrating the donation was held Thursday, November 29, 2001 on the pier. It rained all day - until just before the 2:00 p.m. ceremony skies cleared briefly. As the dedication ceremony took place a beautiful rainbow broke out over the beach at Avila - an auspicious beginning to Cal Poly’s taking over operations of the pier for marine science education and research. Unocal retains ownership of the land at the base of the pier with the shoreline and water under the pier under the jurisdiction of the Harbor District and California Coastal Commission. The Harbor District grants a use permit and a 49 year ground lease agreement with Cal Poly (Resolution No. 04-10). 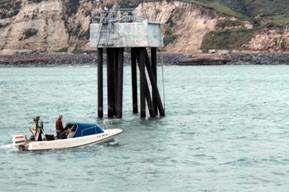 The Coastal Commission approved CDP 3-01-015 changing the use of the Unocal Pier in Avila Beach from an inactive petroleum distribution facility to an educational/marine research facility. Progress is made converting the pier from an industrial facility to a marine research and educational facility. A flowing sea-water system is installed, and scientific boating and diving programs are operated from the pier. Unocal merges with the Chevron Corporation. Chevron continues to be an active supporter of Cal Poly and the pier. 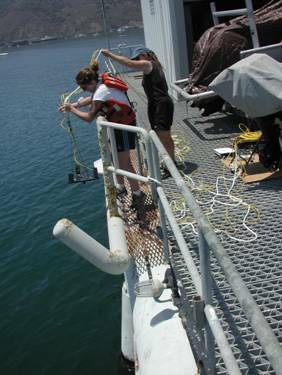 Cal Poly students and faculty members continue to use the pier for classes and marine science research. Future plans include expanding the facility to include more classrooms, additional research space and public educational facilities. Krieger, Daniel E. San Luis Obispo County: Looking Backward into the Middle Kingdom. Northridge: Windsor Publications, Inc., 1988.